In the first experiment, they recorded 161 college students reading a passage aloud; this first recording captured baseline acoustics. The participants were then randomly assigned them to play a specific role in an ensuing negotiation exercise. Students assigned to a “high” rank were told to go into the negotiation imagining that they either had a strong alternative offer, valuable inside information, or high status in the workplace, or they were asked to recall an experience in which they had power before the negotiation started. Low-rank students, on the other hand, were told to imagine they had either a weak offer, no inside information, or low workplace status, or they were asked to recall an experience in which they lacked power. The students then read a second passage aloud, as if they were leading off negotiations with their imaginary adversary, and their voices were recorded. Everyone read the same opening, allowing the researchers to examine acoustics while holding the speech content constant across all participants. Comparing the first and second recordings, the researchers found that the voices of students assigned to high-power roles tended to go up in pitch, become more monotone (less variable in pitch), and become more variable in loudness than the voices of students assigned low-power roles. And the students’ vocal cues didn’t go unnoticed. A second experiment with a separate group of college students revealed that listeners, who had no knowledge of the first experiment, were able to pick up on these power-related vocal cues to determine who did and did not have power: Listeners ranked speakers who had been assigned to the high-rank group as more likely to engage in high-power behaviors, and they were able to categorize whether a speaker had high or low rank with considerable accuracy. In line with the vocal changes observed in the first experiments, listeners tended to associate higher pitch and voices that varied in loudness with high-power behaviors. They also associated louder voices with higher power. Musical training accelerates cortical thickness maturation. Music training was associated with the rate of cortical thickness maturation in a number of brain areas distributed throughout the right premotor and primary cortices, the left primary and supplementary motor cortices, bilateral parietal cortices, bilateral orbitofrontal cortices, as well as bilateral parahippocampal gyri. Our finding that music training was associated with cortical thickness development in the premotor and primary motor cortices is not surprising, given that both regions contribute to the control and execution of movement. Music training was also found to influence cortical thickness maturation within aspects of the DLPFC. Myriad imaging and neuropsychological studies have implicated the DLPFC in aspects of executive functioning, including working memory, attentional control, as well as organization and planning for the future. 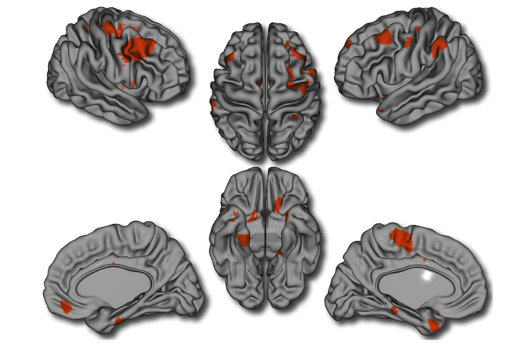 Interestingly, developmental structural neuroimaging studies have shown that participants with quantitatively higher scores on attention problems exhibit delayed cortical thickness maturation in portions of the DLPFC as well as other cortical regions. This study resolves a long-standing question about the ability of humans to perceive near infrared radiation (IR) and identifies a mechanism driving human IR vision. A few previous reports and our expanded psychophysical studies here reveal that humans can detect IR at wavelengths longer than 1,000 nm and perceive it as visible light, a finding that has not received a satisfactory physical explanation. We show that IR light activates photoreceptors through a nonlinear optical process. Vision relies on photoactivation of visual pigments in rod and cone photoreceptor cells of the retina. The human eye structure and the absorption spectra of pigments limit our visual perception of light. Our visual perception is most responsive to stimulating light in the 400- to 720-nm (visible) range. First, we demonstrate by psychophysical experiments that humans can perceive infrared laser emission as visible light. Moreover, we show that mammalian photoreceptors can be directly activated by near infrared light with a sensitivity that paradoxically increases at wavelengths above 900 nm, and display quadratic dependence on laser power, indicating a nonlinear optical process. Biochemical experiments with rhodopsin, cone visual pigments, and a chromophore model compound 11-cis-retinyl-propylamine Schiff base demonstrate the direct isomerization of visual chromophore by a two-photon chromophore isomerization. Indeed, quantum mechanics modeling indicates the feasibility of this mechanism. Together, these findings clearly show that human visual perception of near infrared light occurs by two-photon isomerization of visual pigments. The signature of consciousness in resting-state brain activity. I've done a number of posts on attentional or salience versus default mode long-range connectivity networks in our brains (for a review see my lecture.) They correspond roughly to supporting outward task oriented processes versus inward processes such as daydreaming or imagining. Activity in these networks is thought to be a marker of consciousness, but this idea conflicts with observations that long-range functional connectivities persist even after loss of consciousness caused by anesthesia, or in vegetative state patients. This post is to point to recent work by Dehaene and collaborators showing clear difference in the behavior of long-range networks in awake and anesthetized monkeys. Their abstract and statement of significance, followed by a movie showing whole brain connectivity patterns at different time points in the awake monkey. What are the origins of resting-state functional connectivity patterns? One dominating view is that they index ongoing cognitive processes. However, this conclusion is in conflict with studies showing that long-range functional connectivity persists after loss of consciousness, possibly reflecting structural connectivity maps. In this work we respond to this question showing that in fact both sources have a clear and separable contribution to resting-state patterns. We show that under anesthesia, the dominating functional configurations have low information capacity and lack negative correlations. Importantly, they are rigid, tied to the anatomical map. Conversely, wakefulness is characterized by the dynamical exploration of a rich, flexible repertoire of functional configurations. These dynamical properties constitute a signature of consciousness. 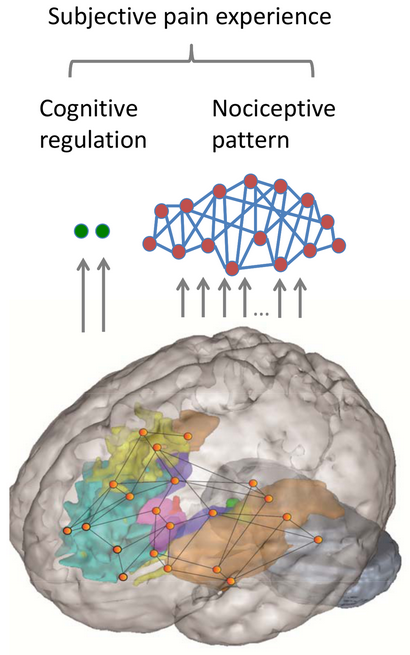 At rest, the brain is traversed by spontaneous functional connectivity patterns. Two hypotheses have been proposed for their origins: they may reflect a continuous stream of ongoing cognitive processes as well as random fluctuations shaped by a fixed anatomical connectivity matrix. Here we show that both sources contribute to the shaping of resting-state networks, yet with distinct contributions during consciousness and anesthesia. We measured dynamical functional connectivity with functional MRI during the resting state in awake and anesthetized monkeys. Under anesthesia, the more frequent functional connectivity patterns inherit the structure of anatomical connectivity, exhibit fewer small-world properties, and lack negative correlations. Conversely, wakefulness is characterized by the sequential exploration of a richer repertoire of functional configurations, often dissimilar to anatomical structure, and comprising positive and negative correlations among brain regions. These results reconcile theories of consciousness with observations of long-range correlation in the anesthetized brain and show that a rich functional dynamics might constitute a signature of consciousness, with potential clinical implications for the detection of awareness in anesthesia and brain-lesioned patients. Dynamical connectivity matrix - red lines mark positive correlations, and blue lines mark negative correlations. Sixty-eight percent of the studies that clearly found a bilingual advantage were published, compared with 50% of the studies that found mixed results supporting the bilingual-advantage theories, 39% of the studies that found mixed results partly challenging those theories, and 29% of the studies that found no differences between monolinguals and bilinguals or found a bilingual disadvantage. On the whole, 63% of the studies supporting the bilingual advantage were published, compared with only 36% of the studies that challenged it. This difference in publication percentage based on the outcomes of the study could be the result of a bias during several steps of the publication process: Authors, reviewers, and editors can decide to submit or accept only studies that showed positive results. In the first step of the publication process, the file-drawer problem could play an important role in the observed publication bias. Authors could decide not to publish studies with null or mixed results, or they could choose to submit their results only partially, for example, by leaving out tasks that did not show an effect of bilingualism. The article by Treccani et al. (2009)[Treccani is a co-author of the current paper] is an example of the file-drawer problem, as it excluded the experiments that did not show an effect of bilingualism. On the next level, reviewers and editors might reject manuscripts reporting null, negative, or mixed results more often than manuscripts reporting positive effects. This rejection is often based on the argument that null effects are difficult to interpret, or the result of poor stimulus design... Mahoney (1977) asked journal reviewers to referee manuscripts reporting positive, negative, mixed, or null results with identical methodological procedures. Although the methodology was the same, reviewers scored the manuscripts reporting positive results as methodologically better than the manuscripts reporting negative or mixed results. For manuscripts with positive results, reviewers usually recommended acceptance with moderate revisions. For manuscripts with negative results, however, their usual recommendation was major revision or rejection. Manuscripts with mixed results were mostly rejected. Brain activity is profoundly rhythmic and exhibits seemingly random fluctuations across a very broad frequency range (less than 0.1 Hz to greater than 600 Hz). Recently, it has become evident that these brain rhythms are not just a generic sign of the brain-at-work, but actually reflect a highly flexible mechanism for information encoding and transfer. In particular, it has been suggested that oscillatory synchronization between different areas of the cortex underlies the establishment of task-relevant networks. Here, we investigated whether gamma-band synchronization (~40 Hz) is causally involved in the integration between the two brain hemispheres of alternating visual tokens into a coherent motion percept. We utilized transcranial alternating current stimulation (tACS), a novel non-invasive brain stimulation technique, which allows frequency-specific entrainment of cortical areas. In a combined tACS-electroencephalography study, we selectively up- and down-regulated interhemispheric coherence, resulting in a directed bias in apparent motion perception: Increased interhemispheric connectivity sustained the horizontal motion percept, while decreased connectivity reinforced the vertical percept. Thus, our data suggest that the level of interhemispheric gamma-band coherence directly influenced the instantaneous motion percept. From these results, we conclude that synchronized neuronal activity is essential for conscious perception and cognition. The study they cite as showing less effect of exercise than subliminal priming used the same standard "Short Physical Performance Battery" to assess changes in physical ability caused by the interventions. This test assesses strength, gait, and balance by examining (a) time to rise from a chair and return to the seated position five times, (b) time to walk 8 feet, and (c) ability to stand with feet together in the side-by-side, semi-tandem, and tandem positions for 10 s. Possible scores range from 0 to 12, with a higher score indicating better physical performance. Older individuals who receive lower scores on this measure have increased risk of disability, nursing-home placement, and mortality. ...we hypothesized that pro-inflammatory gene expression would be up-regulated in extraverts and people with high levels of openness to experience (both of whom would be expected to experience elevated risk of injury/infection) and down-regulated in conscientious individuals with comparatively strong behavioural immune responses. The present results identified systematic differences in leukocyte gene expression that correlate with individual differences on two major dimensions of human personality: Extraversion and Conscientiousness. Consistent with predictions from behavioural immune response theory, Extraversion was associated with up-regulated expression of pro-inflammatory genes, whereas Conscientiousness was associated with down-regulated expression of pro-inflammatory genes. These effects were independent of major health behavioural factors (BMI, smoking, alcohol consumption, physical activity); independent of variations in leukocyte subset prevalence; independent of negative affect; independent of minor physical symptoms and related medications; and independent of demographic characteristics as well as other major dimensions of human personality. In contrast, none of the major personality dimensions was significantly associated with differential expression of the other primary gene module involved in the CTRA profile – antiviral and antibody-related transcripts. In the context of previous data linking Extraversion and Conscientiousness to health and longevity, the present functional genomics findings may provide new insights into the molecular basis for such relationships. Their results do not support the model of neuroticism and negative affect generating a 'disease-prone personality.' Numerous other studies have correlated the trait of conscientiousness with longevity. The unforeseen costs of extraordinary experiences. People seek extraordinary experiences—from drinking rare wines and taking exotic vacations to jumping from airplanes and shaking hands with celebrities. But are such experiences worth having? We found that participants thoroughly enjoyed having experiences that were superior to those had by their peers, but that having had such experiences spoiled their subsequent social interactions and ultimately left them feeling worse than they would have felt if they had had an ordinary experience instead. Participants were able to predict the benefits of having an extraordinary experience but were unable to predict the costs. These studies suggest that people may pay a surprising price for the experiences they covet most. More than 600 people have paid a minimum of $250,000 for a seat on the world’s first commercial spacecraft, soon to be launched by Virgin Galactic. Their journey will last a few hours, but they will talk about it for years to come...Floating weightless for several minutes while gazing down at Earth is an experience that falls somewhere between delightful and dazzling, which is why so many people are willing to pay so much money to have it. The less obvious consequence is that such experiences can make the people who have them strangers to everyone else on earth—and, as a rule, earthlings do not always treat strangers so nicely. At worst, people may be envious and resentful of those who have had an extraordinary experience, and at best, they may find themselves with little to talk about. Indeed, when people interact, they typically discuss the things they have in common and an afternoon in orbit typically is not one of them. Extraordinary experiences are both different from and better than the experiences that most other people have, and being both alien and enviable is an unlikely recipe for popularity. In one experiment subjects in groups watched a video (17 groups of 4 participants, each watching in their own cubicle - afterwards they were escorted to a room for 5 min of unstructured conversation. One of the participants in each group watched a video that was superior to the video watched by the others. Participants who had watched the superior movie felt more enjoyment just after the film, but felt excluded during a subsequent social interaction, and this left them feeling worse than participants who had had an ordinary experience instead. A second experiment showed that participants correctly predicted that the extraordinary experience would leave them feeling better than the ordinary experience would before the interaction, but failed to realize that it would leave them feeling worse after the interaction. In a final study participants were asked to estimate how the actual participants in Study 1 felt. The result found was that they did not expect the extraordinary experiencer to be excluded from the interaction, and they expected the extraordinary experiencer to feel better—not worse—than the ordinary experiencers. Pleasures come in two varieties: the social and the nonsocial. A hallmark of the nonsocial pleasures—whether the cool tingle of Dom Pérignon or the hot snarl of a new Maserati—is that people adapt to them quickly, which is why such experiences are typically best when they are novel or rare. The social pleasures have a different appeal. People crave acceptance, belonging, and camaraderie, and the hallmark of these pleasures is that they come more readily to those who fit in than to those who stand out. The two varieties of pleasure give rise to a pair of incompatible desires: to do what other people have not yet done and to be just like everyone else. Satisfying the first of these desires can frustrate the second. When extraordinary experiences separate a person from others, these experiences may ultimately reclaim more joy than they provide. ..the way to think about these things has less to do with the invulnerability promoted by the official doctrines, and more to do with, one might say, using these doctrines to take the edge off of vulnerability, to allow one to experience life without becoming overwhelmed or depressed or resentful or bitter, except perhaps at the extremity of loss. There is some combination of embedding oneself in the world in a vulnerable way and not being completely undone by that vulnerability that is pointed at, if not directly endorsed, by the official doctrines. It seems to me that Taoism, Buddhism, Stoicism, etc. work not by making one invulnerable but rather by allowing one to step back from the immediacy of the situation so that the experience of pain or suffering is seen for what it is, precisely as part of a contingent process, a process that could have yielded a very different present but just happened to yield this one. Another point would be the evolution of our social brain has resulted in a built in bias towards feeling the sort of vulnerability and bonding that sustains and defends social group identity. A group of floating detached Taoists isn't all that useful in intergroup conflicts. Finally, disciplines that result in maintaining emotional distance from others can also let atrophy the evolved neuroendocrine chemistries that can vitalize our physiology and longevity. Biological explanations for psychopathology decrease clinician empathy.